And It Came Upon A Midnight Clear! Betwixt And Between Earth Growth! In the Wonder of It All . . .God Is! World Changes Ready or Not! Something’s Coming! Universal Cities of Light, Love and Healing! The City of Light Sedona is the first of 14 Cities of Light, Love, and Healing, Imagine That! 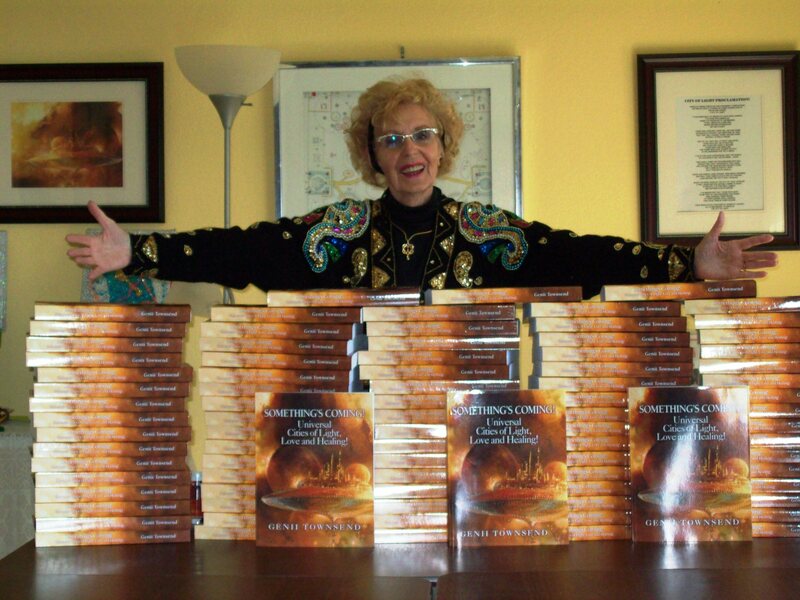 Best-selling author Genii Townsend with the first 100 autographed copies of SOMETHING’S COMING! SOMETHINGS’ COMING! is Now Available in Print. Autographed copies of the new expanded 444 page printed edition of SOMETHING’S COMING! Universal Cities of Light, Love, and Healing! are now available for $34.95 plus $6.95 shipping and handling in the US ($19.95 in Canada and $23.95 other countries). that make you feel like you just came home. past memory hurts with no emotion attached. and sitting on benches that massage your body. only crying would be for the pure joy of the experience. gather to help bring forth Peace on this Earth. IT’S NOT ONLY POSSIBLE… BUT PROBABLE! In this publication, Genii shares information she has kept secret for 25 years. The book describes several prophecies, the purpose and plans for a prototype City of Light. 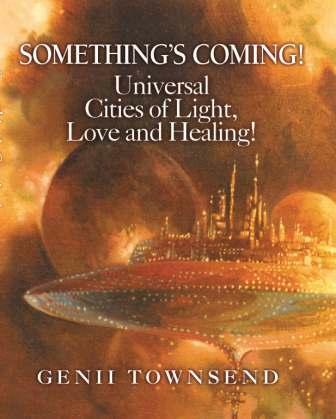 Included are diagrams and descriptions of advanced “Light Healing Technologies”, discussion of the need for spiritual awakening and enlightenment on earth, and Sedona’s past and future “ultimate destiny” as a City of Light. This blog site has been created as an online “intentional community” where readers of The City of Light Sedona and graduates of The Sacred 4 Keys to Light Teachings may share your insights and feedback. It is also one of the major places where Genii will share her ongoing messages and visits to The City of Light Sedona with Charter Members of The Sedona Light Center. Please join WordPress and share your wisdom, your resources, your feedback and your recommendations with our community. Since we published The City of Light Sedona in 2009, I have been sharing the exciting information I have received from hundreds of visits I have been blessed to take into the City of Light. When we published my second book, I was guided to title it SOMETHING’S COMING! Universal Cities of Light, Love and Healing! Now as a result of my visit to the City of Light Embassy of Peace Headquarters May 27th, I am so happy and grateful to share the following report that the CITY OF LIGHT is ALREADY HERE, Imagine That! “Oh My God! Is this what we are to expect upon our delivery? First class does not say it! OMG does! How can I explain this?” I wonder as tears of thanksgiving run down my face. It has been a long time in coming, but well worth the wait. OMG! People will be saying these words for it could be no other as nothing else fits what I am experiencing. Click Here to read my complete report on this exciting visit to the City of Light and our invitation to help us develop and operate a City of Light Information Center in Sedona based on the guidance I was given. GOD’S CITY OF LIGHT! Giving Credit Where Credit Is Due! The light, streaming out from the City entrance, is quite bright, as I approach thru inner meditation sighting. Also, people are in large crowds heading for the same entrance and knowing that at 3 more entrances the same thing is taking place, it is not unlike a future scene, as the City of Light appears on ground level here in the Sedona, Arizona area. Note: I am advised that people will come by the thousands to see what has taken place under strange circumstances. Feeling like there is an invisible pull which makes my way a bit quicker, I weave my way throughthe people. Ah! Finally, at the Gate, I see my guide La-Luke who with his own inner light seems to part the sea of onlookers. Almost on the run, we zip thru the cozy park and onto the funny trolley heading for the Embassy. “Golly, how many times have we done this scene?” We are whisked to the stage door of this amphitheater, thru the back curtains and onto the inner stage where Ooo-lon awaits us patiently. A couple of fancy throne-like chairs are set in place as I see the hundreds of universal beings that are also in attendance. O: “It will be! You have been called back as there needs to be a message for Title clearing. This City has been called by many names. So as this City of Light, Love, and Healing comes into your 3/d world with so much progress being pre-made, we need to give credit where credit is primarily due, so all can recognize the producer from the beginning thought. Under any banner, in God’s City of Light, God is the true creator, call it by any name you choose it still remains the same, the Primal Source spoken of in any language, religious or not. It matters not! Those interested in the Holy Christ, the Buddha, and assorted master teachers (of which there are many), all know what the source of all is and thus, taking the teachings to where people can understand on any level. All is correct. No one is left out! Well, guess what? Peace and love are on the way, and wars of any kind will be no more. Ever! Ever! No one wins…Ever! God’s City of Light and Healing! ‘GOD’ pretty well says it all, and Genii, as you say, “I can spell God!”. Imagine that ! O: “Of course, be it religious, spiritual, or any kind of positive thinking, not necessarily religious, whatever? It takes in all on this planet from the Borneo jungles to the high buildings in some locations, and I might add all the animals that come into your planet filled with love to help balance out where love is not. It is God’s love for us all including everyone here sitting in this audience, and those who desire the Divine knowledge teachers of all kinds give in service. Remember, the way opens for healing and healing that you will receive. In God’s love, darkness cannot dwell in any shape or form and people can be healed from anything that has been a problem, including changing the mental that has brought it into appearance. God is the problem solver and always has been, and always will be. Even the Christ can tell you that God is all and can do anything! In your teaching sessions of the 4 Keys to Light, have you not elevated those to be ‘Light Linked’ to serve others, as well as understanding this City of God? Of course. So then, take this message as God makes ‘Real Magic’ as the teacher Wayne Dyer speaks of in his book you love as the City of Light appears (now on the ground, just not seen at the moment) with 13 more duplicate God Cities around the planet to serve mankind. Belief in a God of love, somewhere in the ethers making real magic appear is emotionally balancing, but a way of thinking fun thoughts as well. Speaking of your teachers you know of the Pastor Joel Osteen, who understands very well of this and sends his God messages out telling all who will hear that God can do anything. That, Dear One, is fun thinking. Understand? So why not have a City of Light that can heal with this advanced technology? Note: This vision ended and I am back home ready to spend my day loving my God puppy Light Spirit and those people I love on ground level. “As the previous messages move out into the public expect more interest to be shared. This is to be expected as people mentally begin looking to the Sedona location and want to be as close to the City of Light as possible meaning the Sedona area in particular for a home base. “So a movement of groups especially Light Links, would of course activate more Light Power to show new comers the ropes so to speak. It is by no chance that the Renee and the Diana and the Nina are to be in this location. It is time for those of ‘light’ minds to gather ‘before’ the City appearance for guidance on what to expect and to lead newcomers to the land of the City. “The Charles has a wide mentality of what could be accomplished in various projects he is working on but he has also been the chosen male entity to lead people thru his understanding and development of plans that could be put in to action as the first of many people land on your decks. “Preparedness is essential as time lessens before the City appearance. Property will run sky high in value. To be in the vicinity for even for a few days and to feel the holiness would be very important with totally nothing stopping the trip. “That which has been revealed thru this inner communication is quite correct as the Light frequencies bring the power of cleansing and releasing the old mentality thus permitting love to enter, ready or not. “As the message of the City of Light’s arrival hits the media, all attention will look to your area and a flood of people will almost drop everything and look to see for themselves what has taken place. Even those with guns in their hands with a war like mentality, will assume that such a heavenly vision had taken place that warring is not an option. Was it only a vision or something much more? Oh yes…Much more! “To have those who are now in the knowing of the City and are on Sedona grounds can support in many ways, especially the Light Links who know the Holy Codes and now are sounding them daily for the City of Light appearance. They will be shown how they can help as Guides into the City. The Renee is a connector of such a plan as are close others, which includes the Diana and the Nina and of course the Charles as his part is just beginning. After receiving these two messages, and as Charles and I were preparing to meet with two of the new people moving to Sedona to help with the Light Center and The City of Light, we were inspired to develop and issue the following Invitation. Sedona, Arizona has prospered for decades attracting millions of visitors every year to “the most beautiful place in the USA” according to USA Today. Over the past few years, Genii Townsend (author of The City of Light Sedona and SOMETHING’S COMING! Universal Cities of Light, Love and Healing!) has received several messages about how many thousands, perhaps even hundreds of thousands, of people will come to Sedona from all over the world as The City of Light Sedona manifests. Sedona is a small town of about 10,000, it is somewhat landlocked with national forests on 3 sides and an estimated 4 to 6 million people visit every year. Genii has been told repeatedly that so many people will be flocking to the area when The City of Light appears that property values will skyrocket. Recently, several individuals from across the country who have participated in The 4 Keys to Light Sacred Teachings Genii facilitates have been guided to move to the Sedona area to help with The City’s birthing. The Light Center is helping those who are interested in living here connect with others who are also planning a move so they might collaborate and perhaps even consider shared housing arrangements. One day recently, Genii and Charles Betterton (cofounders of The Sedona Light Center) both received Guidance about manifesting “StewardHeirShip” over properties in the area, primarily to support The City of Light as people move here and or come for visits, training, or healing once The City is open for business. That Guidance led us to develop this Invitation for anyone who is interested in helping us acquire and manage real estate, (housing and potentially commercial space for offices, training programs etc.) to participate in mutually beneficial ways. Charles is a community economic development specialist who has over 40 years of experience in disaster relief, turn-around management, housing and community development. He will serve as the Interim Project Manager. Charles has also lived in spiritually oriented intentional communities for 25 years and has produced major events featuring world-class authors and trainers for up to 1,800 participants. Renee Trenda who has lived in the intentional community of Stelle, Illinois for a couple of decades will serve as Property Manager. She has been active in The Sedona Light Center, has sponsored events with Genii in Illinois, Indiana, Kentucky and Georgia AND she recently moved to the Sedona area. She will help with The Light Center and with the Natural Action Structured Water devices available through Ultimate Destiny. The vision Genii and Charles received is to provide multiple ways for people to participate in this process of helping make residential accommodations available for ‘Light Workers” who want to live here and or visit. For example, anyone who would like to just support the project with a donation could make a donation to The Light Center. Anyone who would like to donate but needs a tax deduction would make their donation through our affiliated non-profit CENTER SPACE ( Center for Spiritual, Personal And Community Enlightenment) which has a 501 (c)(3) Fiscal Sponsor. Anyone who would like to invest in the project and or 1 or more specific properties could do so on a equity basis, a revenue share basis, or a combination of those. For the meantime, those equity investments would be directed through our affiliated cause-oriented company, Ultimate Destiny Network, Inc. (also cofounded by Genii Townsend and Charles Betterton). It may also be that we would incorporate 1 or more LLC’s depending upon the level of interest and the preferences of potential funders. Anyone who has wealth and believes in The City of Light but is not presently interested in moving to Sedona could provide major funding, let’s say a few hundred thousand dollars in donations, equity or a combination. Based on their preferences and level of financial support, all or part of the property acquired with their funds would be available for them on a priority basis if and when they do move here. Another example is someone who might be more interested in investing in a way that generates monthly cash flow. For them Ultimate Destiny would offer Revenue Sharing Options where they could receive part of the cash generated through rental of residential and or commercial space, and possibly revenue from the types of major events we could coproduce here like we have produced in the past. We are publishing and sharing our invitation by email, on the Sedona Light Center web site, in the PDF edition of SOMETHING’S COMING and will then add it to an updated printed edition of Genii’s book as soon as possible. If you have any interest in participating in this project, visiting and or moving to Sedona, participating in The 4 Keys to Light, or if you just have questions, please call us at 928-284-5566 or send us an email. The City of Light Sedona IS Disclosure and Revelation! Greetings from Sedona, Home to REVELATION and the DISCLOSURE! From Charles Betterton, Cofounder of The Light Center and Universal Stewardheirship, Inc. 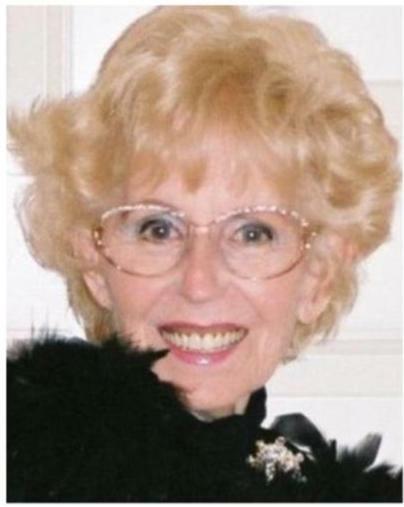 Thanks to the late Ruth Kellogg, my Spiritual Practitioner who had been a secretary to Rev. Dr. William Townsend at the Center for Spiritual Living in Apple Valley, California, I have been blessed and privileged to meet Genii Townsend and help bring forth her books on The City of Light Sedona and SOMETHING’S COMING! Universal Cities of Light, Love and Healing! In late November of 2012, Genii and I took one of our periodic trips to Disneyland where Genii loves to watch the Jedi Training Academy and where she sits on a green bench on Main Street and chats with Walt Disney. We had been talking about the increasing interest on the Planet in the Disclosure of E.T.s. There have been so many articles written about how the disclosure will be made by this country or that world leader. I wondered why the Universal Intelligences (or IT’s as I refer to them) would need to wait for any human being to introduce their existence . . . It seemed to me that the best possible way for disclosure to occur would be for the IT’s themselves to orchestrate such a “revelation”. During my morning meditation and prayer session, it occurred to me that perhaps the manifestation of the City of Light Sedona could possibly be the disclosure. One of my Lead Guides who Genii had introduced me to a few years ago when I attended The 4 Keys to Light class, suggested a question that I should ask Genii to inquire of her Guides. We have included that visit and the answers she received to that question as one of the last pages in the newly published 444 page book, SOMETHING’S COMING! Please know that we deeply appreciate and support the ongoing work of Stephen Bassett and the Paradigm Research Group and all others dedicated to Disclosure! Now that the manuscript is FINALLY complete, I am using the search function within the PDF version to compile excerpts related to various topics beginning with all the references to “disclosure”. I have attached a PDF of References to Disclosures in SOMETHING’S COMING to share with you and anyone else who might be interested in what Genii’s Guides have shared with her on this exciting topic. Thank you one and all for helping share the GOOD NEWS that SOMETHING’S COMING! and the recent update report that THE CITY OF LIGHT SEDONA IS BOTH THE DISCLOSURE AND THE REVELATION, Imagine That!